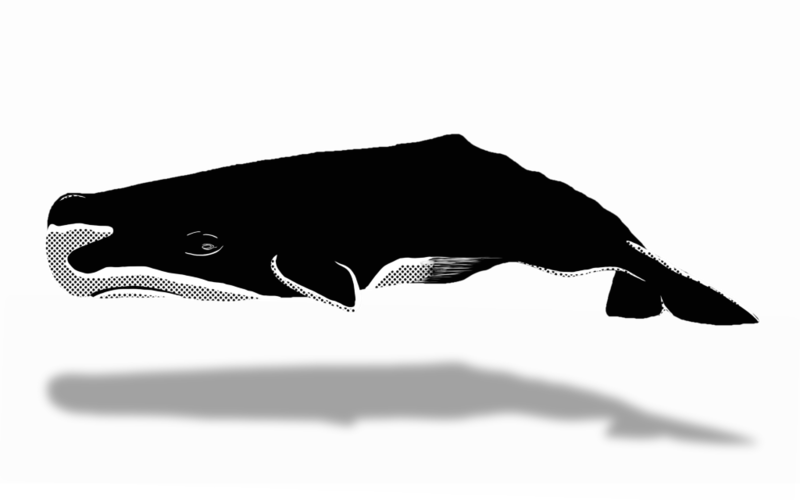 New Zealand is one of the best places to watch sperm whales, all year long. Various types of dolphins live here, too, and occasionally you can also see orcas or other big whales.  Whale watching has a certain tradition in New Zealand: Tours are offered since the 90ies, mostly on the Southern Island, the Northern Island following its lead. With about 500.000 whale watchers per year, New Zealand is one of the most frequented places for whale watching worldwide. 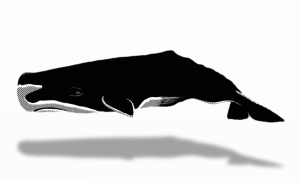 Also, since a couple of years, research is done in how far whales are bothered by commercial whale watching. 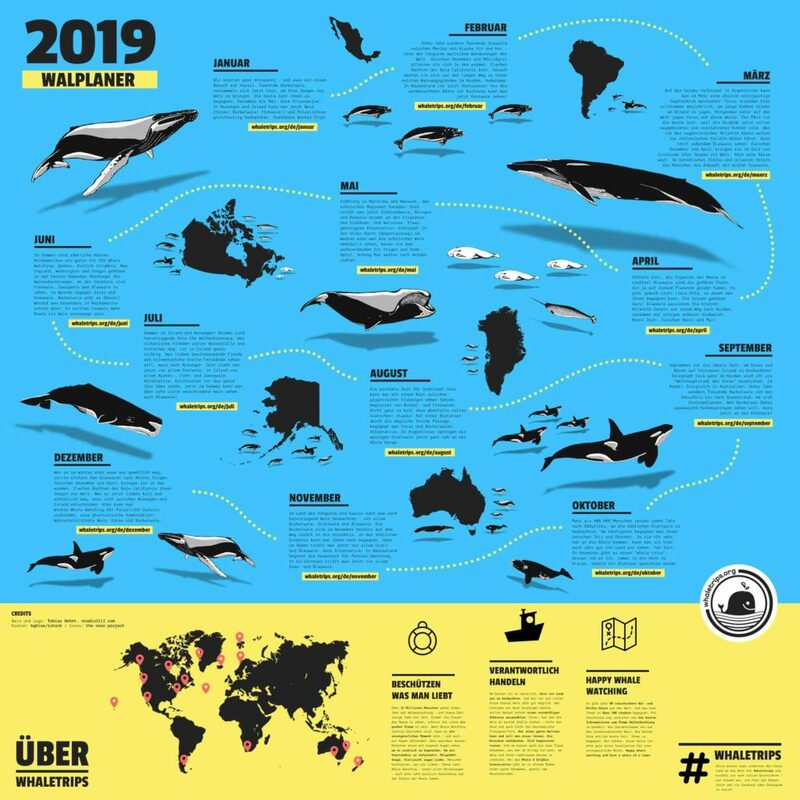 The most important regions on the Northern Island are Hauraki Gulf in Auckland, Bay of Islands in the north and Bay of Plenty in the east where a lot of different kinds of dolphins can be watched all year long. Bryde’s whales are also residents in Hauraki Gulf and can be seen during most of the tours. Occasionally you can also see orcas around the Northern Island. The actual whale watching destination in New Zealand, however, is the Southern Island, where you can watch whales and dolphins in several places. 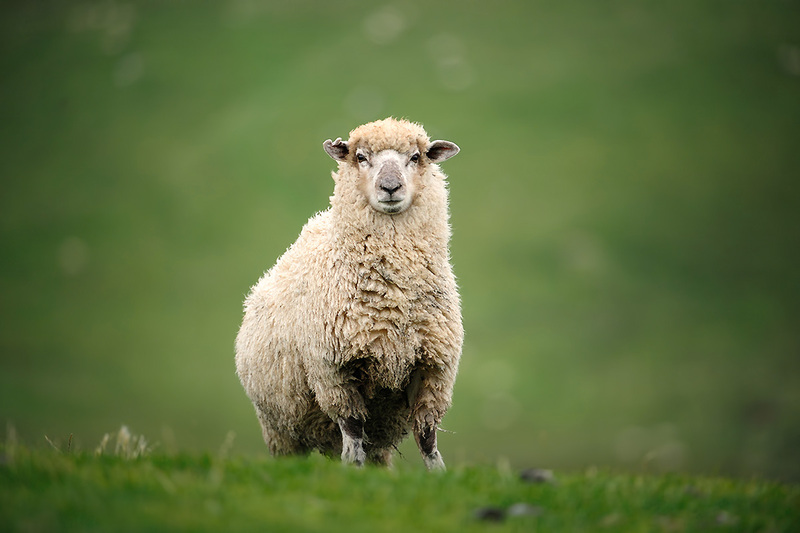 The most well known are Kaikoura and Akaroa from where over 40% of the whale watching tours start. In Kaikoura you can mostly meet sperm whales, which live here all year long in steady groups. They can be watched by boat or from the air by helicopter or ultralight. In front of Akaroa, you can mostly find dolphins, among them the Hector dolphin, which only lives here. 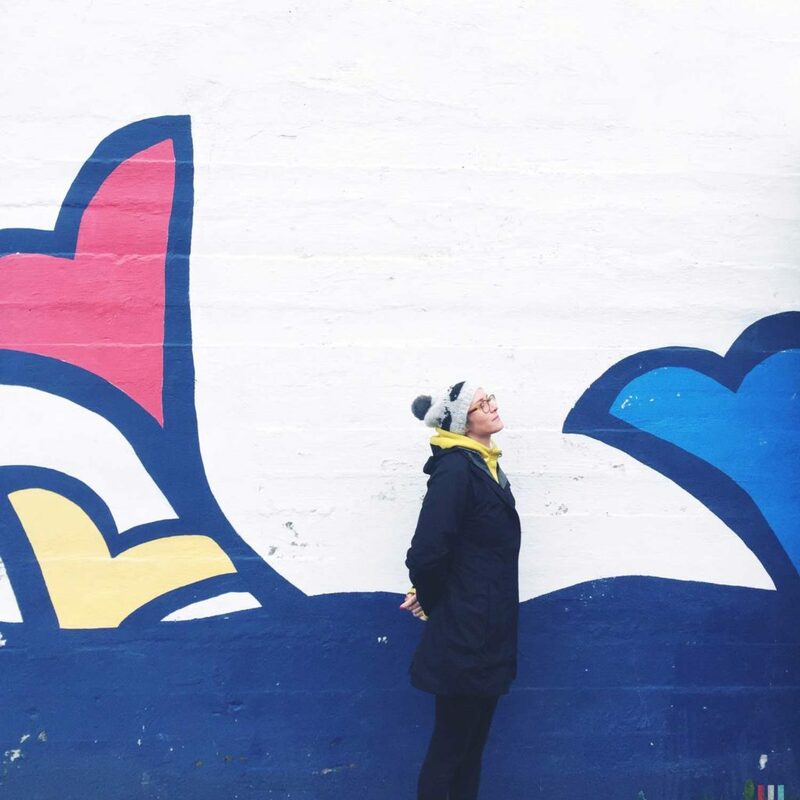 One of the main attractions for tourists is the Fjordland all the way south with its spectacular fjords. There are almost no designated whale watching tours, but dolphins can be seen during most regular boat tours, too. The same goes for boat tours through the Marlborough Sounds and the Tasman Bay on the northern end of the Southern Island. 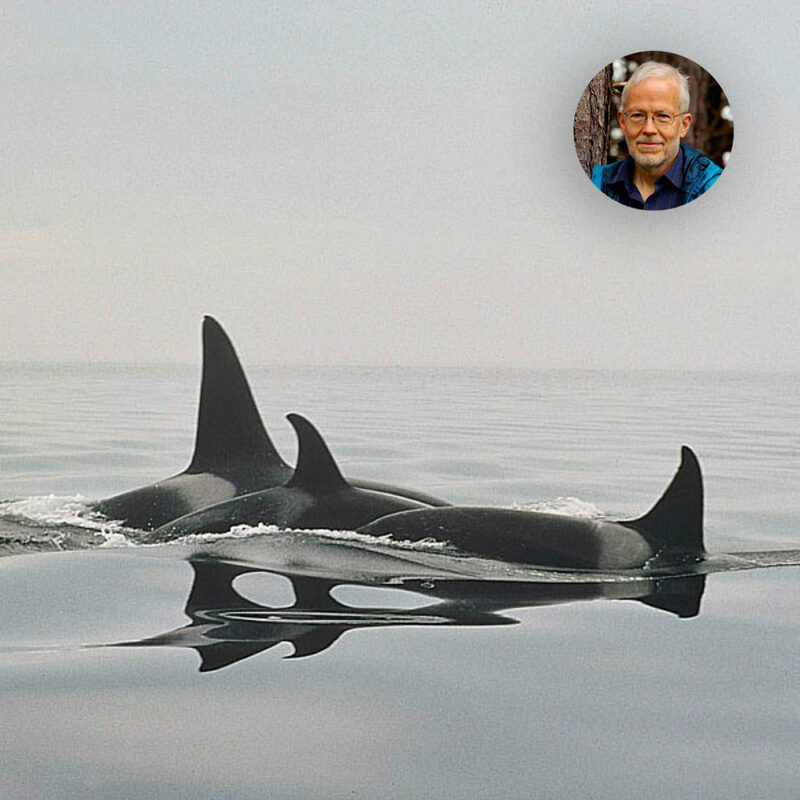 Occasionally, you may see orcas here. 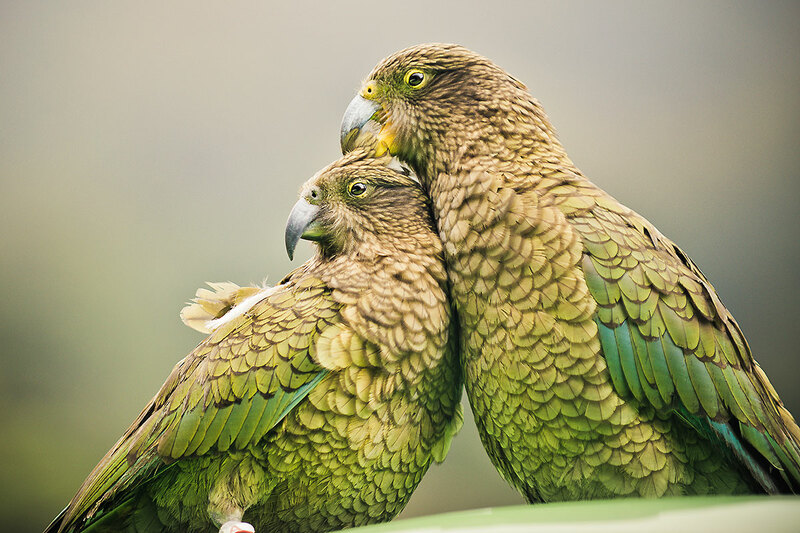 Because of the quickly changing weather in New Zealand, you should always plan with some spare days. 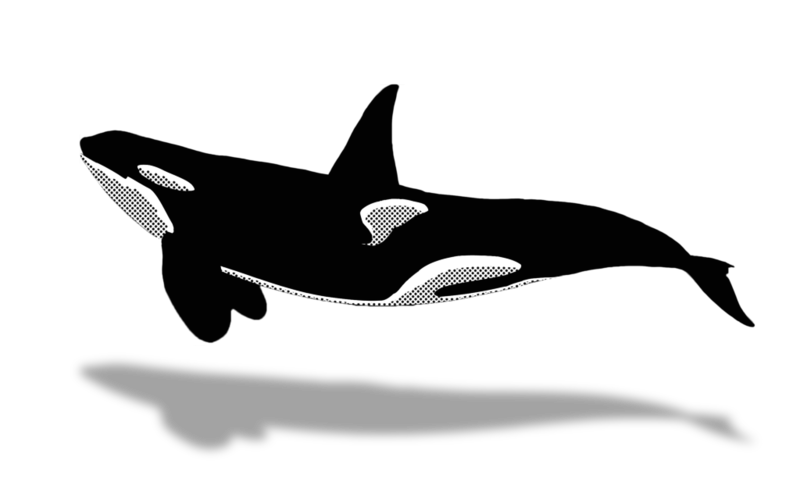 Orcas are the top predators of the oceans. 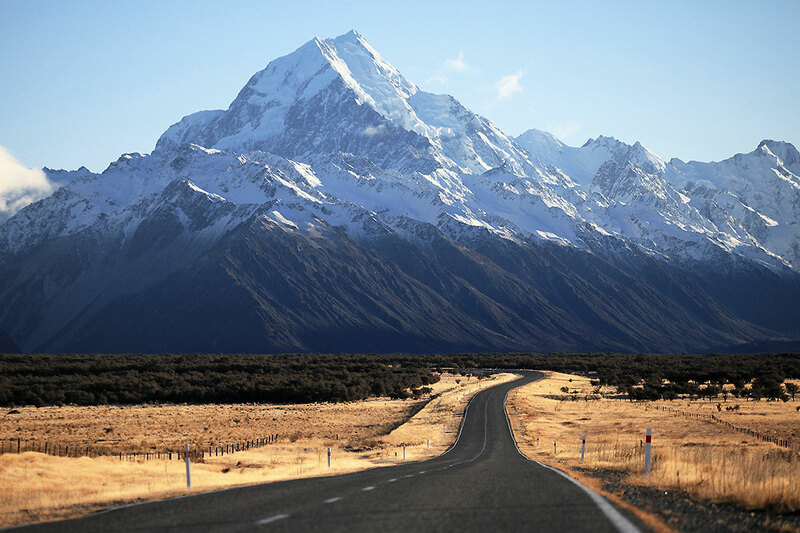 Very reliable places to meet them are Canada and Norway - and sometimes New Zealand as well. 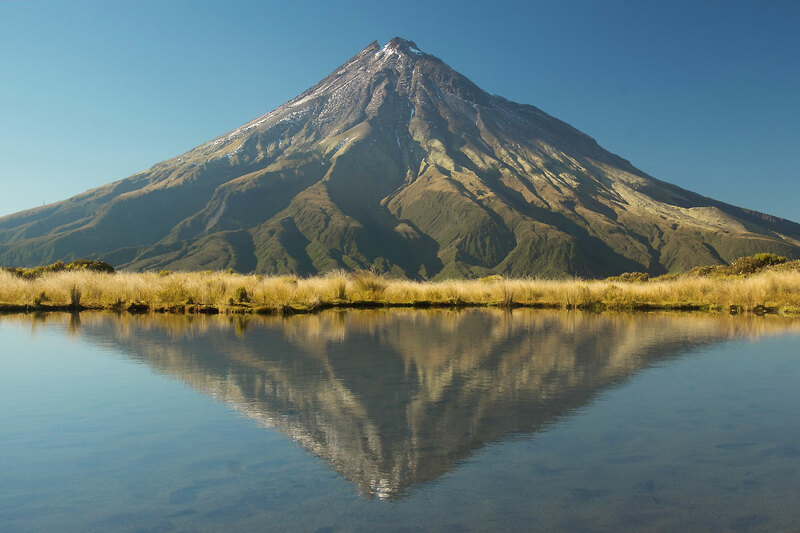 Picturesque fjords, giant glaciers, active volcanoes, huge geysers, boundless rainforests and tropical beaches: New Zealand offers a lot on very little room. Also, there are some of the most beautiful hiking trails of the world to be found here. There is no winter in the north of New Zealand. Instead there is a mild climate here all year, making it the better destination for trips during off- or mid-season. All the way up north at Cape Reinga, Tasman Lake and the Pacific meet. 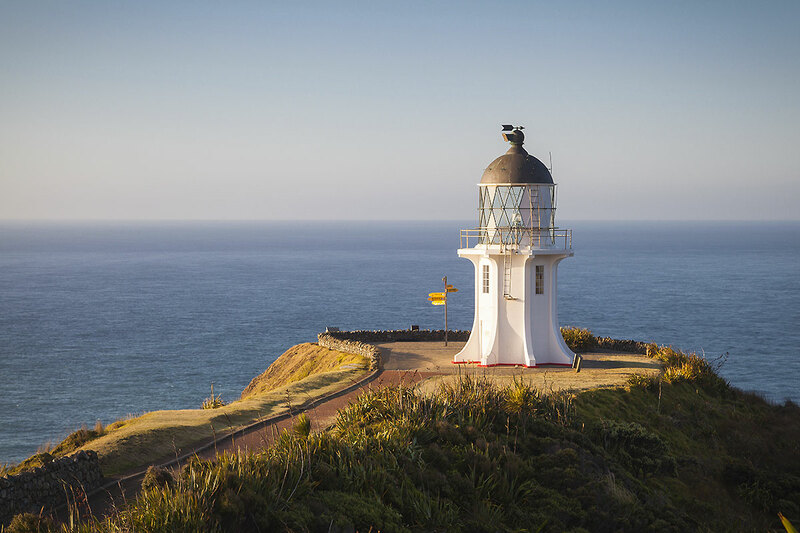 The Cape Reinga Coastal Track offers a five-hour hike along that wild coast. 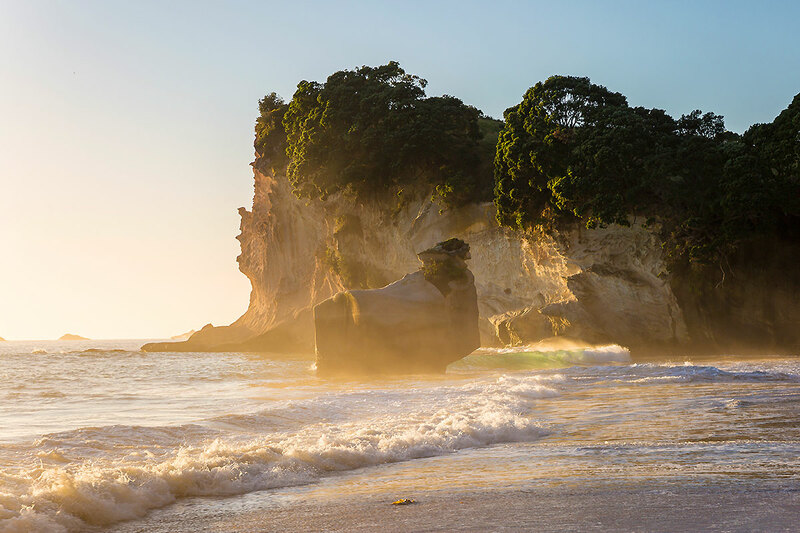 The Bay of Islands and Matauri Bay with their subtropical beaches lie to the east. New Zealand’s version of the sequoia trees, Waipoua Kauri Forest, is to the west. The most important cities of the country are Auckland and Wellington. Wellington is the political and cultural capital; Auckland has a strong Polynesian influence and is a real melting pot. The city was built on top of 50 volcanoes, by far not all of them extinct. The “Coast to Coast Walkway” leads you from Tasman Lake to the coast of the Pacific Ocean all the way through the city. 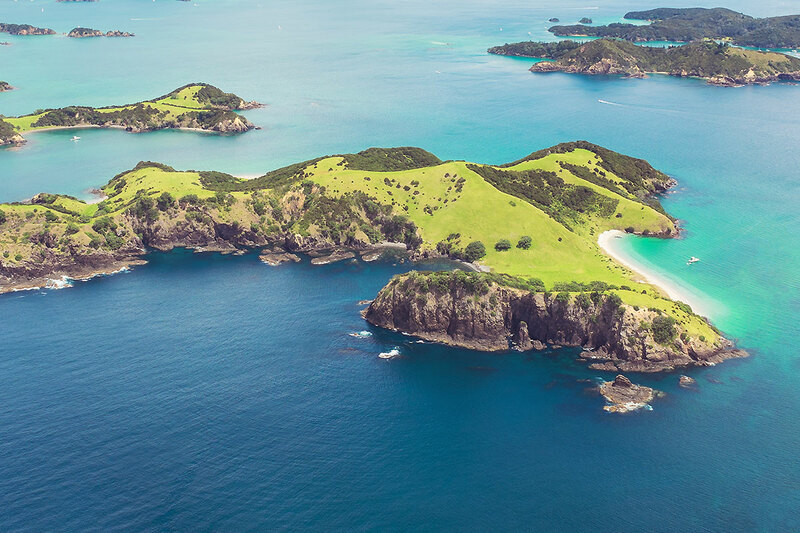 East of Auckland you can find a multitude of little islands in the Hauraki Gulf. The most well-known of them is Waiheke Island. 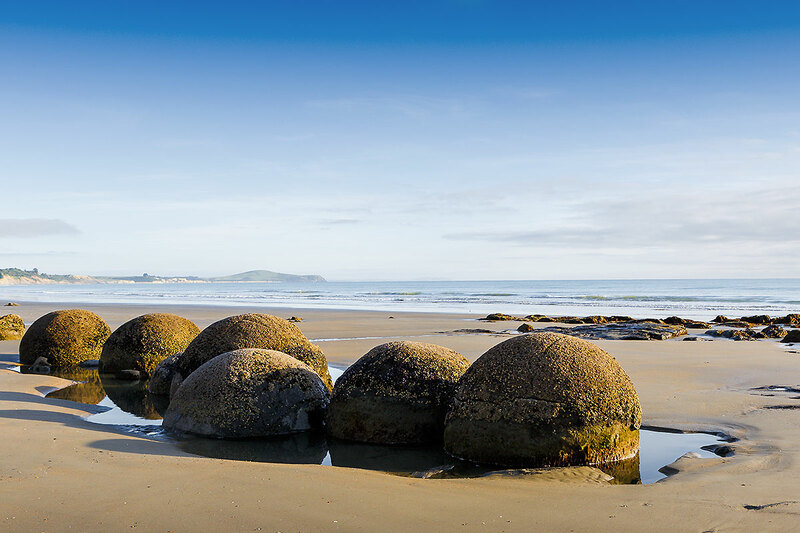 West of the city you can discover the black beaches of Karekare and Piha. 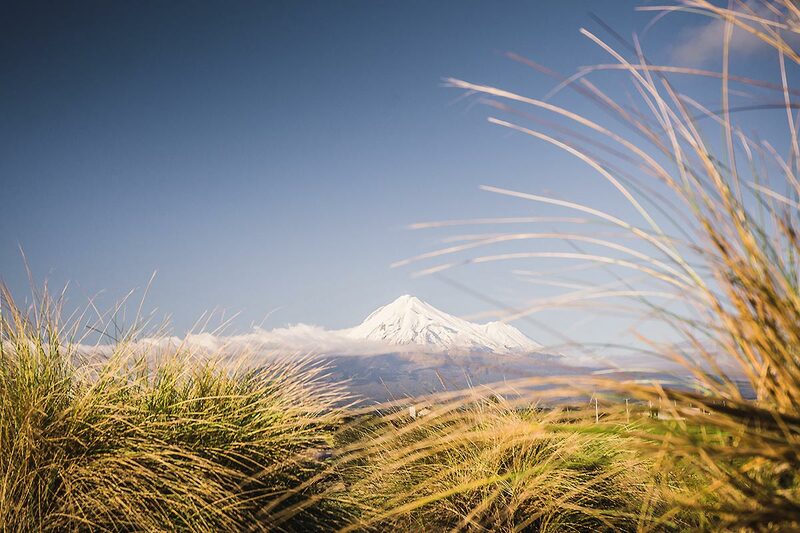 Further inside the Northern Island, Tongariro National Park is home to the biggest lake of the country (Lake Taupo) and three still active volcanoes. (Highest mountain of the island: Mt. Ruapehu with 2.797 meters.) Skiing season lasts until October there. The hike at the Tongariro Alpine Crossing is deemed the most beautiful daytrip of the country (18 kilometers, medium hard). 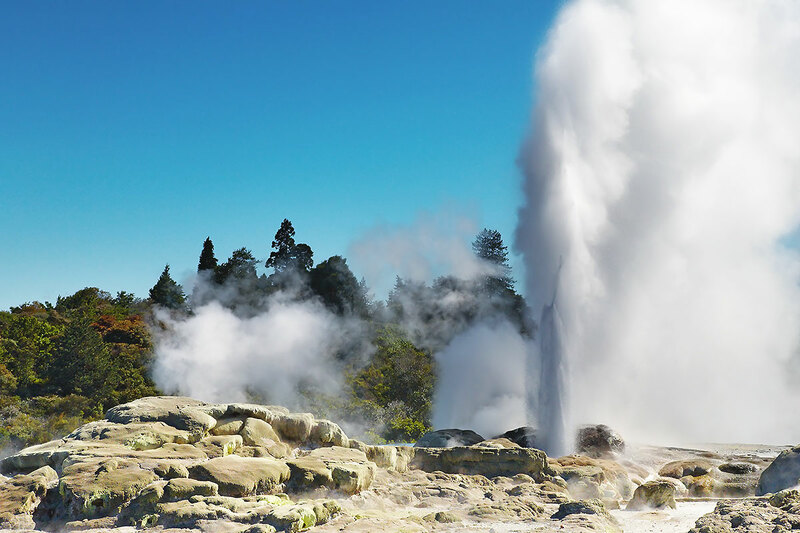 A bit further north at Rotorua, there are the famous thermal springs at Te Puia and Pohutu and 10 meter high geysers. A ferry brings you across the Cook Strait to the Southern Island. 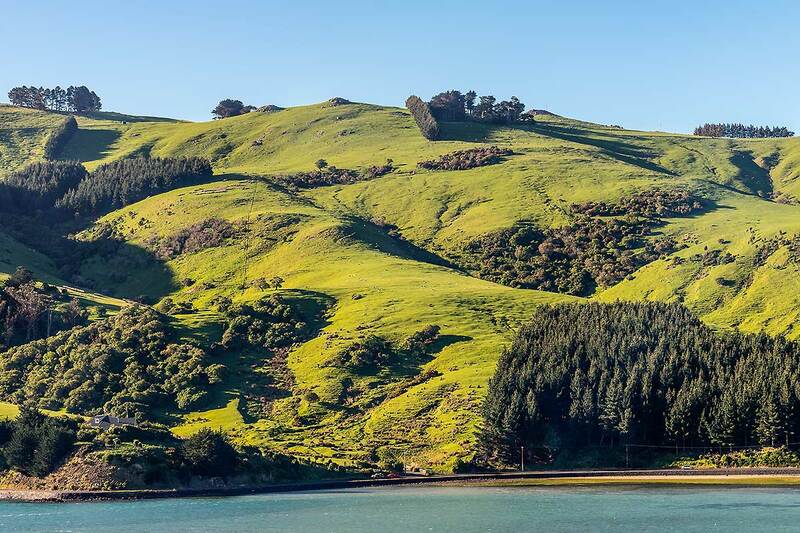 The Marlborough Sounds north of the Southern Island is one of the sunniest and most beautiful regions of the country. From Picton you can go on tours into the Queen Charlotte Sound, some of them done by kayak. 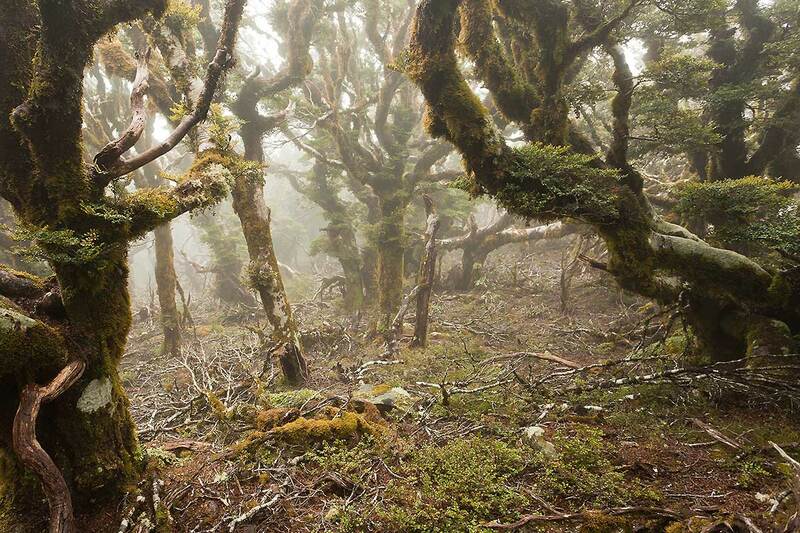 After a transfer by boat, you can also walk the Queen Charlotte Track, a very popular 70 kilometer hiking trail. 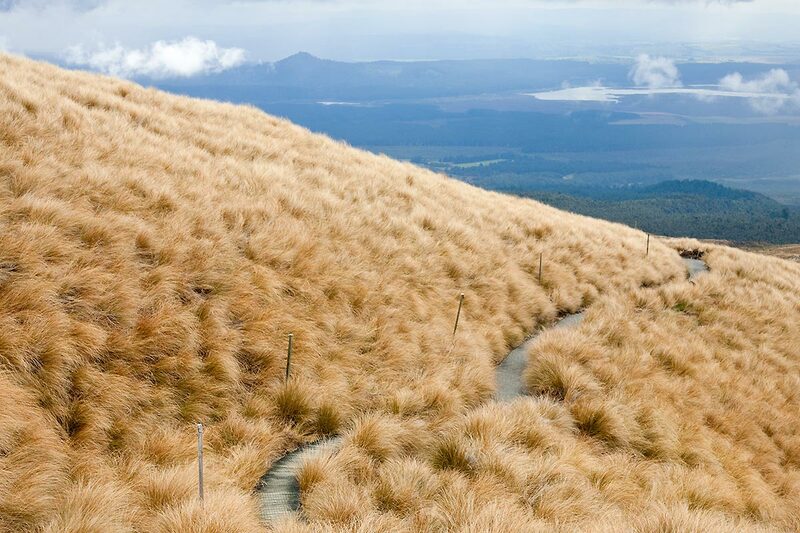 October to April is a great time to go hiking anywhere in New Zealand, preferably during summer from December to March. On the Northern and Southern Island, there are nine “Great Walks”, the most popular and best tended to routes. A good collection can be found at newzealand.com. You need a ticket for every Great Walk, accommodation in cabins included. The Abel Tasman Coastal Track is commonly known as the most popular and most beautiful route. 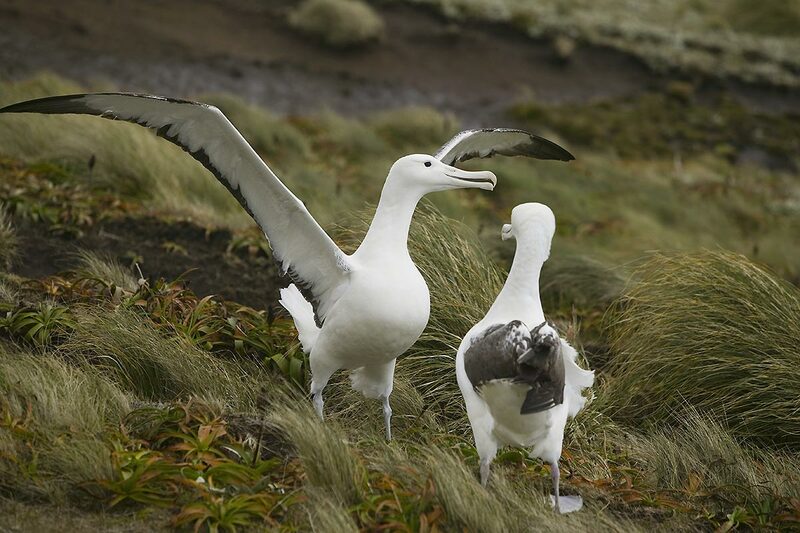 It follows the northwest of the Southern Island along lone beaches and bays. The starting point is Marahau. The whole route is 54 kilometers (3-5 days, medium hard). Segments or guided tours by kayak can be done, too. 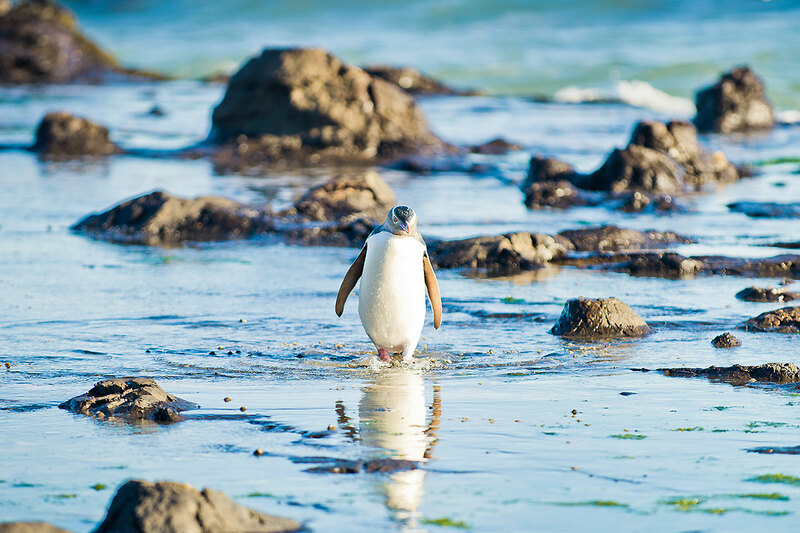 In the east of the Southern Island is Kaikoura, where you can watch whales and dolphins and also penguins, fur seals and albatrosses. The Kaikoura Coast Track is an easy three-day hiking trail of about 40 kilometers along the coast. 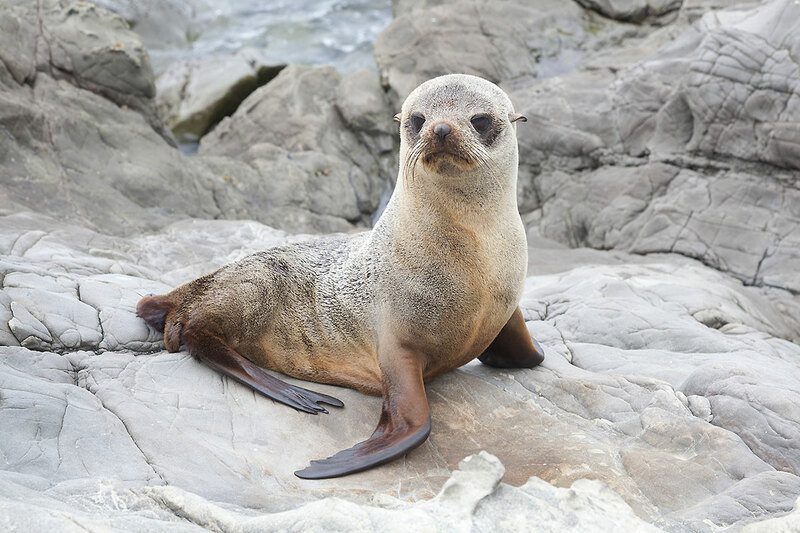 Directly at the city, the Kaikoura Peninsula Walkway, a three to four hour hike, leads you past several sea lion colonies. By the way: The only poisonous animal in New Zealand is an extremely rare spider. Other than that, there are no poisonous or otherwise dangerous animals – other than in Australia, for example. 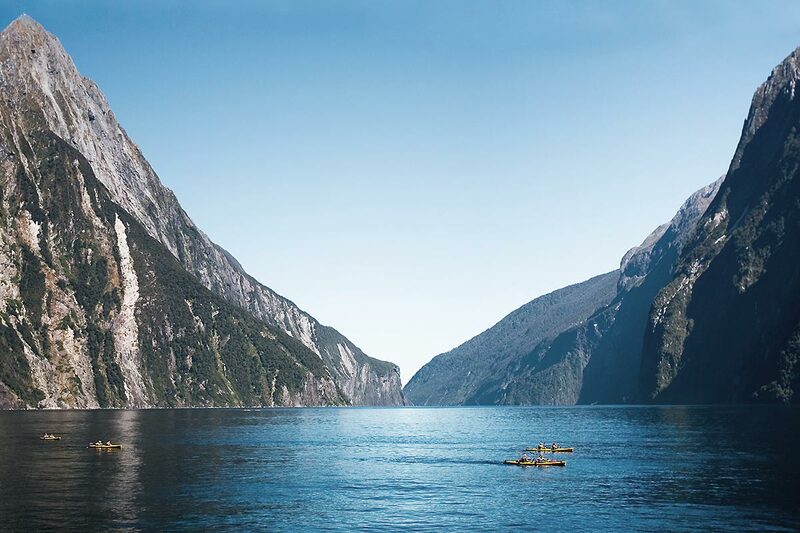 The highlight of the Southern Island is the Fjordland with it’s stunning Milford Sound all the way down in the south: A breathtaking landscape of fjords, no less amazing than the fjords of Norway or Canada. 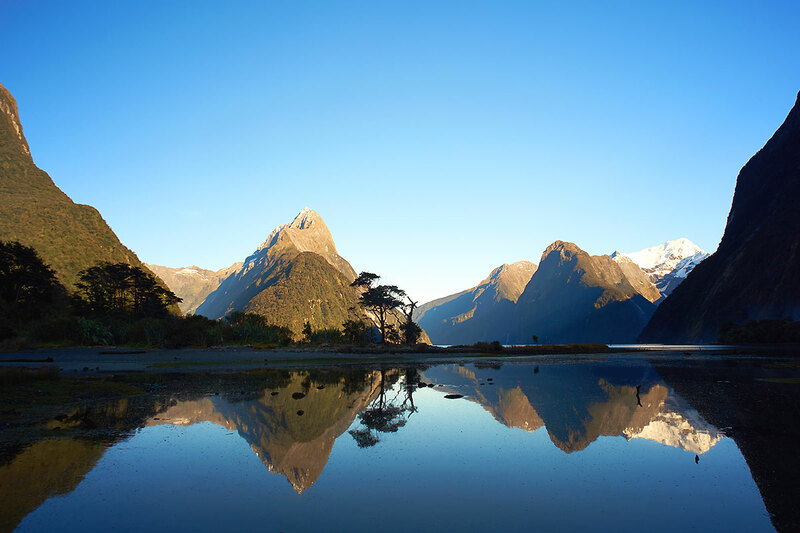 The Milford Track is deemed one of the most beautiful hiking trails of the world. 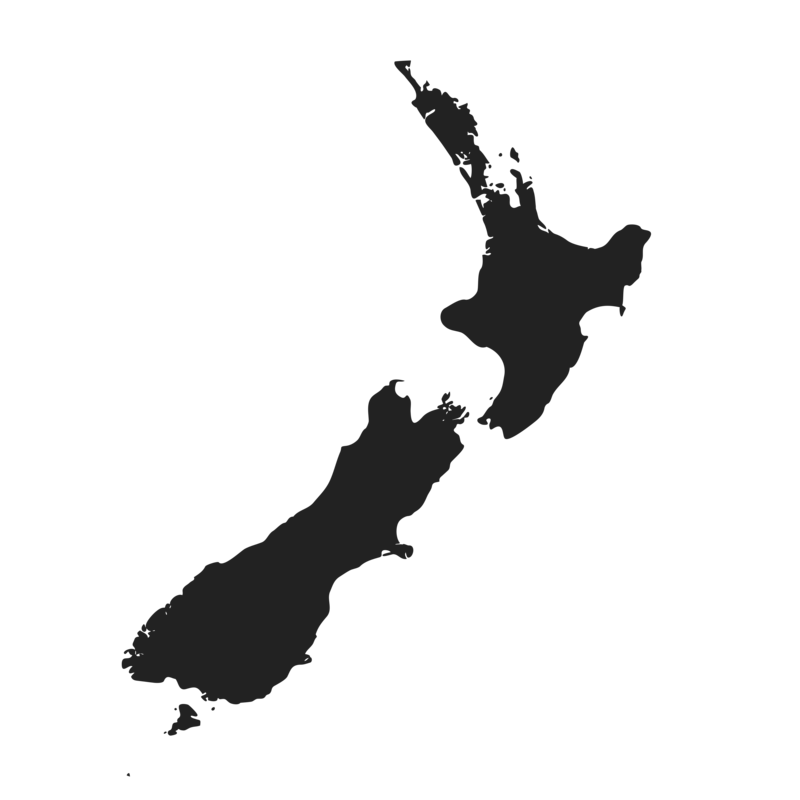 There are less than 15 million people in all of New Zealand. That’s less than 15 people per square meter: More than enough of the gorgeous landscapes for everybody to enjoy!